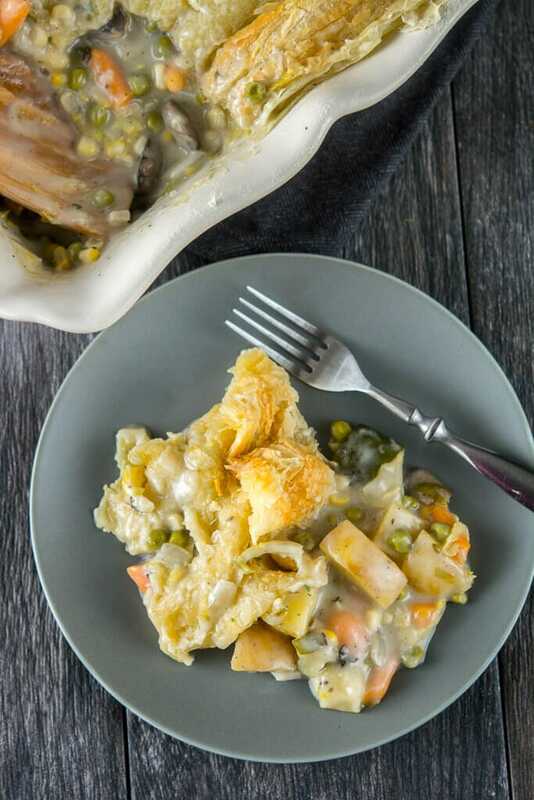 Did you ever think that even during the week, when you are working, transporting kids all around or just all out busy that you would still be able to have a homemade pot pie for dinner? Well, I never did. And even when I though about it I hesitated trying because I was worried it just wouldn’t be the same as a delicious pot pie you might get from your favorite restaurant. But I was wrong. It is almost too easy to make this and besides the one little cheat of using prepared dough it was very homemade. And so easy to put together quickly before heading out the door. We are going to take advantage of frozen veggies here by using peas, carrots, corn and mushrooms that are all ready to go in freezer bags for us. No chopping or dicing! I love frozen veggies because they still pack all the nutrition of fresh but can be so convenient. A few dried spices that you likely have on hand anyway and most of your pie is assembled. At the end we will thicken up our sauce with a little cream and cornstarch and add the topping to cook for another 30-60 minutes. which was perfect. 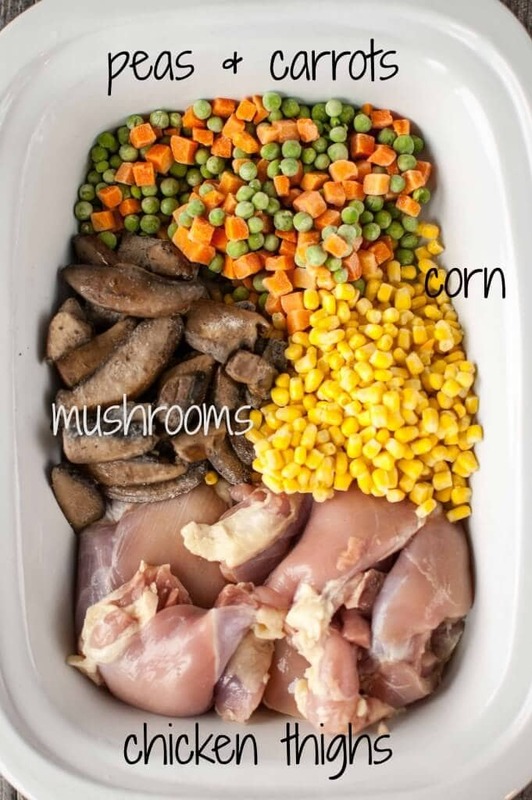 You could easily adapt this to a regular slow cooker as well, you may just need to reduce the amount of crust on top. So what do you think? Pot pie this week anyone?? 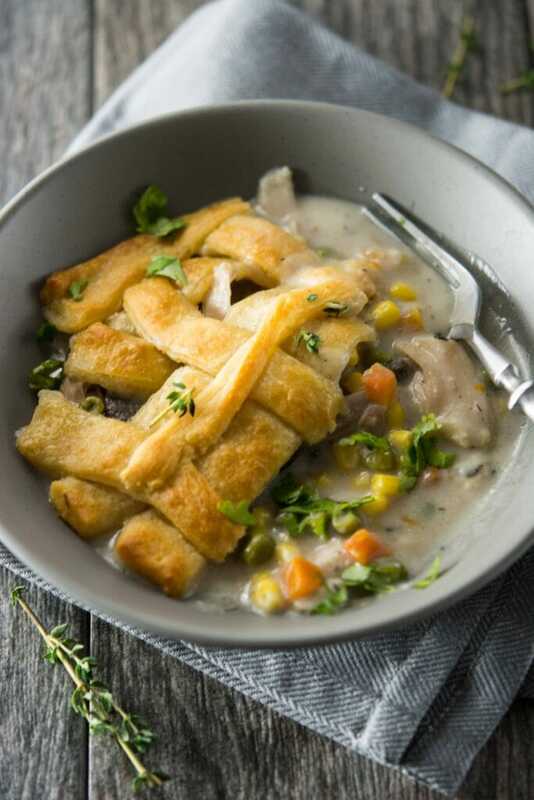 Craving another amazing pot pie recipe? Or, use up some leftover turkey or chicken and make this one! I would love to try this recipe but am concerned about the topping. My oven is not working so I really need to make the crust in a crock pot. I see yours looks devine but I’m so nervous about it coming out soggy and inedible. If I keep it in longer than an hour in order to brown it, will this affect the filling? Have you had to keep it in longer than an hour to get it right? Do you put slits in the dough? Hi Rita! While it just won’t be possible to get the same brown and crispy topping as an oven, one trick I have found is that for the last 30 minutes (or maybe a little longer) you need to get some airflow on top. I place the lid slightly askew on top of the slow cooker and leave it on high to help with the browning process. You could also prop it open with a wood spoon. 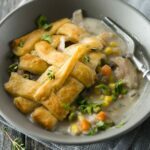 This recipe for Slow Cooker Chicken Pot Pie is so easy and looks so delicious. 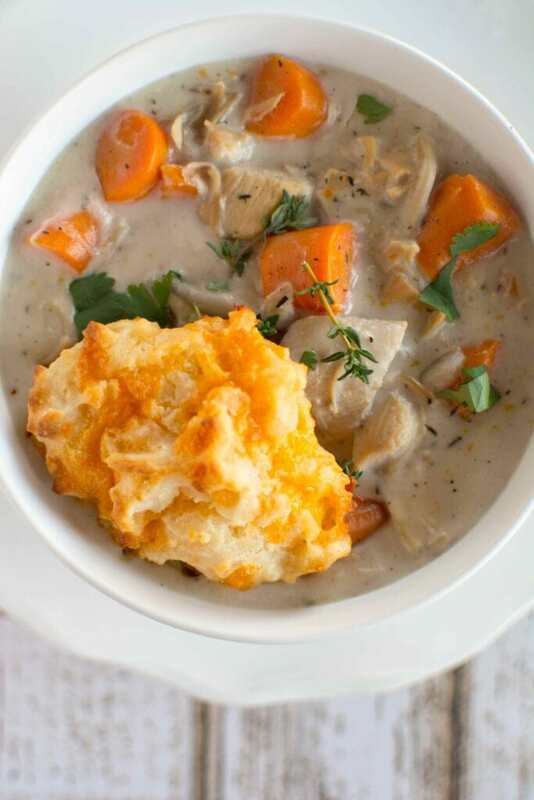 I have saved this recipe as we love Chicken ‘Pot Pie at our home. Thank you so much for this easy recipe. This sounds wonderful! I’m a bit old fashioned when it comes to veggies, though, so I’ll be buying the fresh versions. 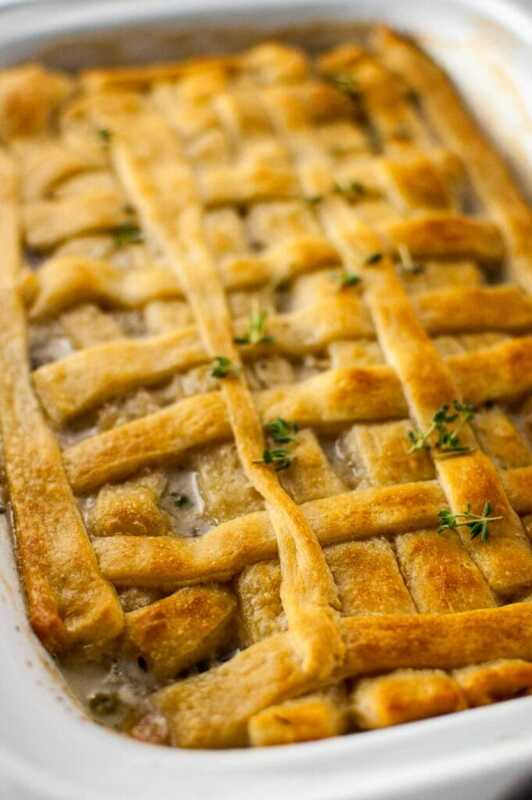 I’m also in love with puff pastry and have used it before for pot pie crusts. I just looks so impressive when I put it on the table. I’ve not tried it in my casserole cooker yet. It was a give from a dear friend who is visiting soon. I thought it would be fun to cook something in it. We’ll be nice & toasty inside and what’s better during cold weather than comfort food?!? 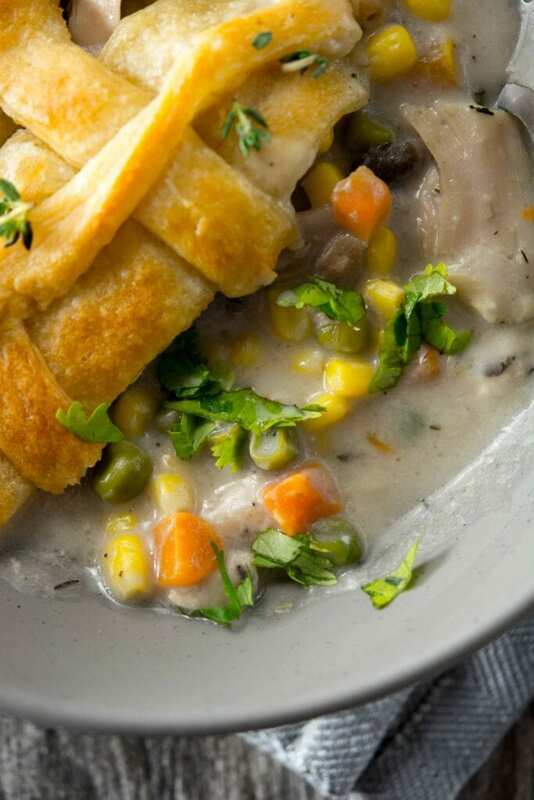 I really like this Chicken Pot Pie Recipe and I plan on making it in our slow cooker. It takes much of the hassle out of cooking. Thank you for this Recipe. My boyfriend and I really loved your recipe! We shared it with some friends, who thought it was good too 🙂 This is our second recipe from you (sriracha-honey chicken was awesome too!) and it will be followed by more. Thank you! I had just one problem. I wanted to put the dough on top of it, but it just drowned into the liquid. Did I use the wrong dough? Or was it just too much liquid? So too much chicken broth? Or maybe I used too much cream, or the wrong cream? I used whipped cream, as we know just one kind of cream here in The Netherlands. But on google I found it was more or less the same as whipped cream. Any tips are welcome! Thanks! Yes, whipping cream and heavy cream should be the same thing. Sounds like too much liquid, there should be some but you should be able to lay the dough across the top and not have it sink. Maybe your cream was a little thinner or your chicken put off a little more liquid while cooking. Next time I’d cut back on the broth and the cream a bit and see if that helps. Sorry it didn’t turn out quite right… hopefully this will fix it for next time. Yes! You will probably need less crust or you could transfer to a baking dish and bake the final step. Hi! 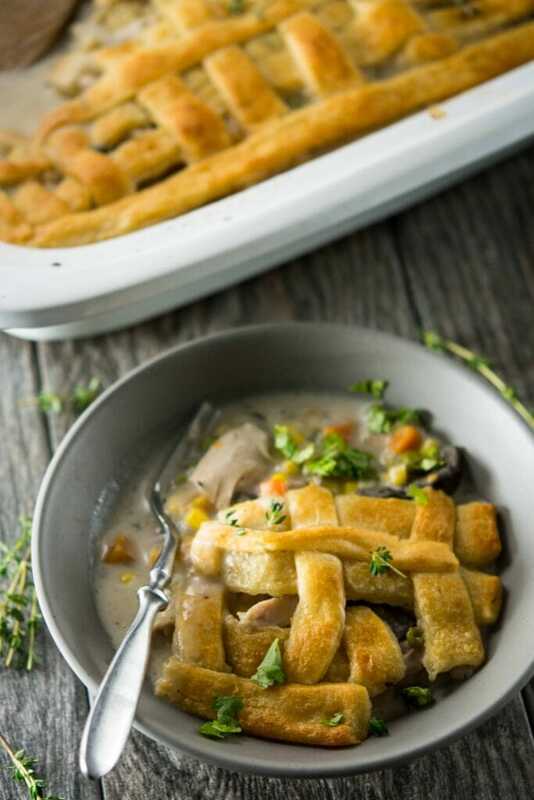 I tried this recipe last night in a regular slow cooker and after the 60minutes on high with the dough it still wasn’t ready, we went ahead and refrigerated the whole pot over night – any recommendations on how to salvage the dish? I’m sure I just put too much dough on ? I just made this today and had the same problem with the crust. It was soggy and would not brown even after 60 minutes on high. I had to scrape off the dough to salvage the contents. Also, when the frozen vegetables “defrosted” in the pot there was way too much liquid in the dish. I won’t be making this again. Should we be using Thyme or Italian Seasoning? It says Thyme in your picture with the spices, but then Italian seasoning in the directions. oops!! I used thyme so I will update the recipe!! 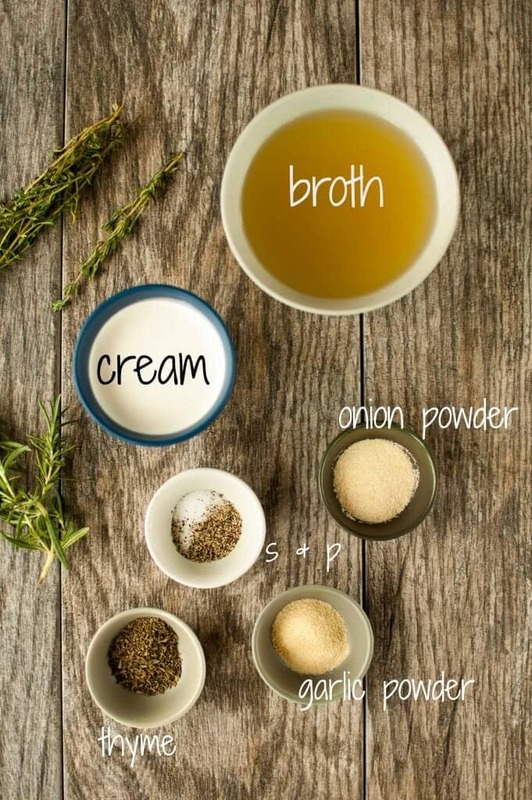 You could, however, sub out another herb you prefer or Italian seasoning instead depending on the flavor you prefer. Thanks for letting me know!! This is an excellent concoction. Some of the veggies can be to your choice so you can make it your way. It is a good and easy recipe and is delicious.